This week we will be looking at the most well-recognized dinosaur of all time! Make way for Tyrannosaurus rex! Tyrannosaurus lived during the Late Cretaceous Period, between 68 and 66 million years ago in what is now Western North America, including Colorado, Wyoming, Montana, South Dakota, Utah, Texas, and also parts of Southern Canada. The genus and species name, Tyrannosaurus rex, translates to "Tyrant Lizard King". The biggest adult specimen on the fossil record of a Tyrannosaurus measured about forty two feet long from snout to tail, making it the biggest known meat eater from its environment. 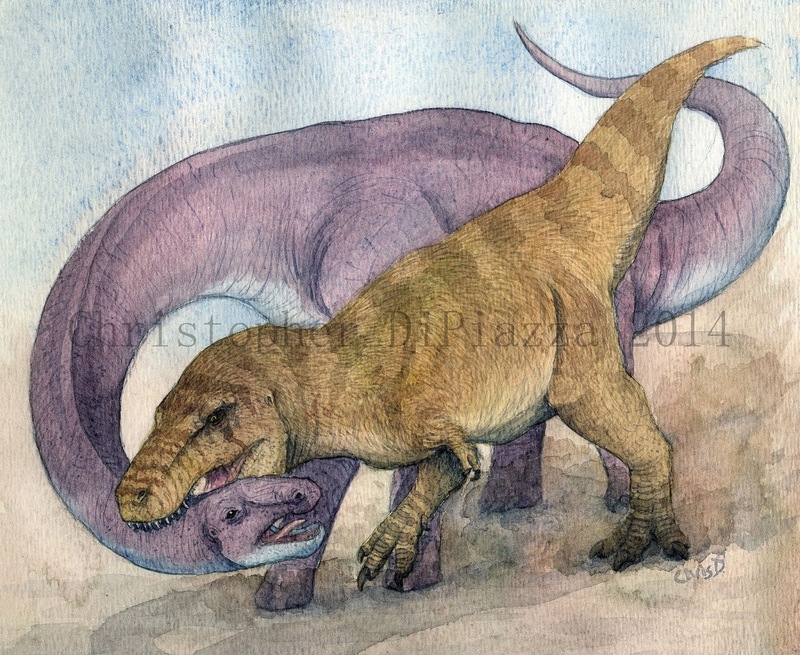 Tyrannosaurus rex attacking a young Alamosaurus. Reconstruction by Christopher DiPiazza. Yup, those are tiny feathers. Given the most recent findings confirming Tyrannosaurus had fine scales, these feathers are sparse enough to have still been a possibility. Tyrannosaurus is the most well-known and loved dinosaur of all time. This is because for a very long time, starting in the early 1900s, Tyrannosaurus was by far the largest meat-eating dinosaur known to science. Since then several other meat-eating dinosaurs have been discovered that rival or even surpass the tyrant king in length, but Tyrannosaurus was still the most robust and massive of all of them. The head of Tyrannosaurus is iconic, and easily distinguishable from any other dinosaur. It's general shape is very rectangular, and its face, especially near the rear of the jaw, was generally wider than what you would see in other dinosaurs, suggesting there were large muscles attached there in life. Tyrannosaurus would have had good eyesight, complete with good depth perception, as well as an extremely good sense of smell. Its nose would have had one of the most acute senses of smell of any animal known. Scientists can tell this by looking at the negative space inside of the skull, where the brain used to be, getting an accurate shape of the brain. Thanks to this, it can be observed that the parts of the brain associated with sight and smell were proportionally large and well-developed in Tyrannosaurus. Cast of the inside of a Tyrannosaurus' braincase on display at the Sydney Museum. The large part on the far left side is the olfactory bulbs, the part associated with sense of smell. The teeth of Tyrannosaurus were larger than those of any other dinosaur (some were a foot long!) and totally unique in form, as well. Most every other kind of meat-eating dinosaur tooth was either flattened and blade-like, for slicing meat, or pointed, and cone-shaped, for holding on. The teeth of Tyrannosaurus, however were curved, serrated and really thick, comparable to the shape of bananas actually...pointy, serrated bananas. This suggests that Tyrannosaurus teeth were adept at utterly pulverizing anything it bit into, including bone. Scientists estimate, thanks to computer simulations of the skull of Tyrannosaurus, that the king of dinosaurs could bite down with over 12 thousand pounds of pressure per square inch, making it the owner of the strongest jaws of any known animal. This makes sense when you consider the animals Tyrannosaurus was coexisting with and feeding on. As the result of one of the most extreme evolutionary arms races in natural history, dinosaurs like Triceratops and Ankylosaurus, both of which coexisted with Tyrannosaurus, were the largest and most heavily-armored forms of each of their families. Tyrannosaurus, in turn, was the largest and most powerful of its family, the pinnacle of tyrannosauridae. In fact, there is direct evidence of Tyrannosaurus having fed on dinosaurs like Triceratops, despite the solid-bone frill, thanks Tyrannosaurus teeth found embedded in Triceratops bones, and chunks of bone found in fossilized Tyrannosaurus poop. 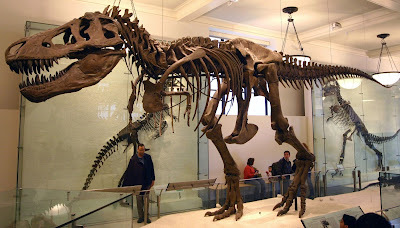 Tyrannosaurus rex skeletal mount on display at the American Museum of Natural History in New York. The legs and tail of Tyrannosaurus would have been extremely muscular. Because it was so large and heavy, Tyrannosaurus likely wasn't a very fast runner, probably not even being able to break twenty miles per hour at top speed, but then again, most of the dinosaurs it would have hunted were about that same speed or slower, anyway, so no real loss there. At top speed, because of its immense weight, Tyrannosaurus would likely always would have one foot on the ground at any time, so it would have been more of a power walk than a run. Interestingly enough, it is the feet of Tyrannosaurus that holds the answer to where Tyrannosaurus' group, the tyrannosaurids, fall on the dinosaur family tree. The feet of all dinosaurs each contain three bones, called metatarsals. (Humans have five metatarsals in each foot.) Most large theropod dinosaurs, like Allosaurus, for instance, have all three metatarsals roughly the same length, neatly positioned next to each other in the foot. In the smaller, more bird-like theropods (including birds), called the coelurosaurs, the middle metatarsal of each foot is a little shorter than the surrounding two, forming an upside down V shape when looking at the skeleton. Well, Tyrannosaurus feet show this same shortened middle metatarsal. At first this may seem odd that the gigantic Tyrannosaurus is more closely related to dinosaurs like Troodon, and modern birds, than it is to other giant carnivores, like Allosaurus or Spinosaurus, but remember that Tyrannosaurus' older relatives, are smaller and smaller the farther back in time you go. Check out Eotyrannus or Guanlong for examples. So even though Tyrannosaurus was a particularly gigantic dinosaur, it was more of an exception among the many more gracile tyrannosauroids that it was most closely related to. 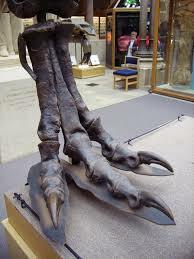 Tyrannosaurus skeleton foot. Notice the upside down V formed by the shorter middle foot bone. Paleontologists have been unearthing and study specimens of what are believed to have been from juvenile Tyrannosaurus within recent years. What is interesting about these specimens is that they don't look like just smaller versions of the adult Tyrannosaurus. Their legs are longer proportionally and they even have different teeth, which are flatter and more blade-like. The number of teeth in their jaws is even different. This tells us that Tyrannosaurus may have been filling a different predatory ecological niche as a juvenile than it was as an older adult. Perhaps the younger Tyranosaurus were better at chasing down and eating more fast moving prey like Ornithomimus or Pachycephalosaurus and then graduated to hunting more heavily armored, but slower Triceratops and Anatotitan, when they were bigger and stronger. There is another theory that at least some of these smaller, seemingly Tyrannosaurus specimens are actually a different kind of dinosaur, which would be called Nanotyrannus. There needs to be more specimens discovered and more research done to completely prove either one of these sides completely, however. Paleontology is mysterious! Juvenile Tyrannosaurus skeleton nicknamed "Jane" on display at the Burpee Museum of Natural History in Illinois. Note how the skull is not as robust as an adult's and how the legs are proportionally much longer. 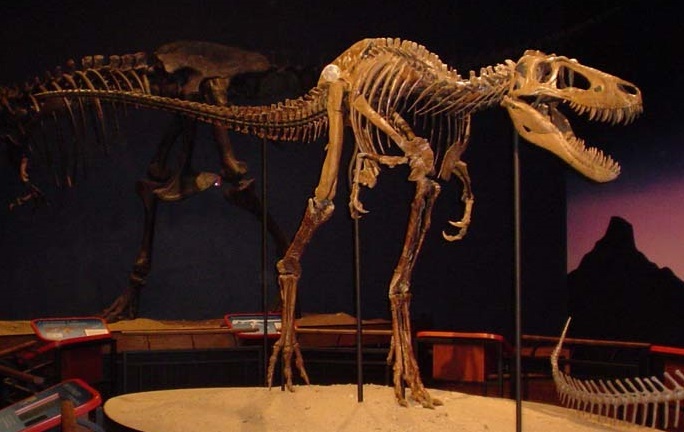 Some believe Jane may actually represent a different kind of dinosaur, called Nanotyrannus. There is much debate as to exactly how Tyrannosaurus would have behaved when it was alive. There is this ongoing argument amongst fanboys as to whether or not Tyrannosaurus was indeed an active predator, killing other dinosaurs on a regular basis for food, or a scavenger, using its keen sense of smell and extremely powerful jaws track and eat the bones and leftover carcasses from prey of other predators. Frankly, I think this is a really stupid debate, mostly egged on by the media more than anything else to get people talking. If you want to know how Tyrannosaurus fed, just look at literally any large meat-eating animal alive today and you will get your answer. It scavenged when it could, and killed when it had to. Seriously, I don't need a time machine to be confident about this. I'd actually be willing to bet large sums of money this was the case. Go ahead, check out modern meat-eaters of all kinds. Lions, bears, crocodiles, eagles, sharks...they all scavenge AND hunt. Debate over. That was easy! 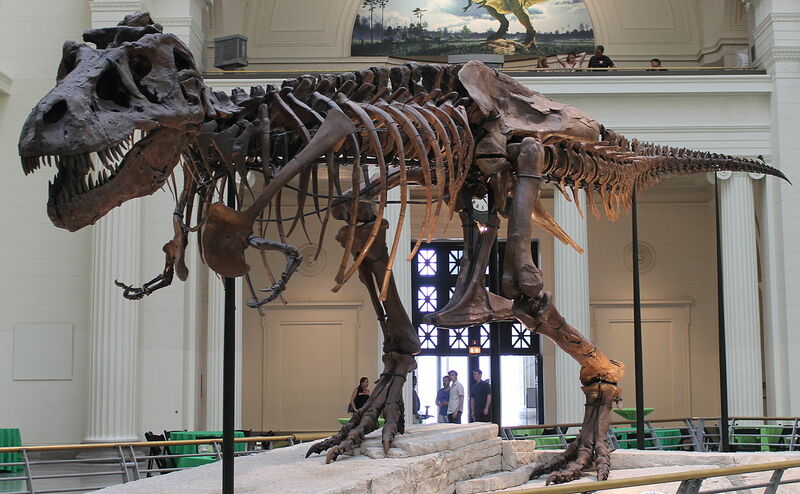 Tyrannosaurus skeleton on display at the Field Museum of Natural History in Chicago. This specimen, nicknamed "Sue" is the largest Tyrannosaurus known to date, at forty two feet long. Several small patches of skin from Tyrannosaruus have been found. The largest of these is about the size of a playing card and is from the bottom of the tail. The others are from the neck and the hips. All of these skin patches show small pebbly scales. When I say small, I mean each scale is about a millimeter in diameter, comparable to the texture of a basketball. That being said, keep in mind Tyrannosaurus was a coelurosaur, the same group of theropods that includes modern birds. In fact, coelurosaurs are known on the fossil record to possess feathers. At least one example of every major branch of this group of dinosaurs has been found with them, including Tyrannosaurus' branch. So did Tyrannosaurus have feathers too? Well, since these scales are so small and close together, it doesn't appear that there would have been room for feathers to have been growing from between them in life. So if Tyrannosaurus did have feathers, they were either very sparse, or concentrated to the top of the neck and back, stopping before the hips. (That second possibility I find unlikely.) It is also possible that Tyrannosaurus simply didn't have feathers at all, making it an evolutionary anomaly, considering the rest of its known family tree had them. For now we still don't know for sure, and that is exciting! Photographs and diagrams showcasing the known scales of Tyrannosaurus from Bell's 2017 paper. To give you an idea as to how small these patches are, the black scale bars for the top two images is 5 centimeters. (neck and hips) The scale bars for the bottom images (tail) are 10 centimeters. Bakker, R.T.; Williams, M.; Currie, P.J. (1988). "Nanotyrannus, a new genus of pygmy tyrannosaur, from the latest Cretaceous of Montana". Hunteria 1 (5): 1–30. Bates, K.T & Falkingham P.L. (2012). Estimating maximum bite performance in Tyrannosaurus rex using multi-body dynamics. Biological Letters. Carpenter, Kenneth; Smith, Matt (2001). "Forelimb Osteology and Biomechanics of Tyrannosaurus rex". In Tanke, Darren; Carpenter, Kenneth. Mesozoic vertebrate life. Bloomington: Indiana University Press. pp. 90–116. Carr, T.D. ; Williamson, T.E. (2004). "Diversity of late Maastrichtian Tyrannosauridae (Dinosauria: Theropoda) from western North America". Zoological Journal of the Linnean Society 142 (4): 479–523. Hutchinson, J.R. (2004). "Biomechanical Modeling and Sensitivity Analysis of Bipedal Running Ability. II. Extinct Taxa" (PDF). Journal of Morphology 262 (1): 441–461. Stevens, Kent A. (June 2006). "Binocular vision in theropod dinosaurs". 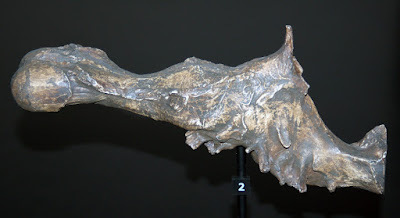 Journal of Vertebrate Paleontology 26 (2): 321–330. Meers, Mason B. (August 2003). "Maximum bite force and prey size of Tyrannosaurus rex and their relationships to the inference of feeding behavior". Historical Biology: A Journal of Paleobiology 16 (1): 1–12. Xu, X.; Wang, K.; Zhang, K.; Ma, Q.; Xing, L.; Sullivan, C.; Hu, D.; Cheng, S.; Wang, S. et al. (2012). 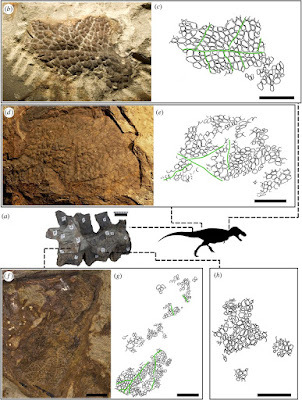 "A gigantic feathered dinosaur from the Lower Cretaceous of China" (PDF). Nature 484 (7392): 92–95. Tyrannosaurs weren't sauropod hunters...and they were terrible at slicing flesh. A tyrannosaur bite is analagous to crushing a box and its contents but not actually cutting the box open. They coexisted with Alamosaurus in parts of North America. I don't see why they wouldn't be given the opportunity. "and they were terrible at slicing flesh. A tyrannosaur bite is analagous to crushing a box and its contents but not actually cutting the box open." I don't think anything I wrote goes against this specifically. Although, as juveniles, Tyrannoaurus appear to have had slicing teeth.